Dan Padavona, author of bestselling horror novel Storberry, is now producing exclusive content on Patreon. “I wanted a new way to interact with my readers and give them content unavailable through traditional sales channels, such as Amazon and Barnes and Noble,” says Padavona. Authors are increasingly turning to Patreon because of its ability to connect writers with loyal readers. For a small fee, readers can support their favorite authors while gaining access to stories unavailable elsewhere. Patreon allows readers and fans to get on the ground floor of new projects from their favorite authors. Readers will often read stories weeks or months before they are released to Amazon and other online book sellers, a benefit many readers love. But Padavona doesn’t only see Patreon as new way to publish his horror stories. He also considers Patreon a revolution for creatives and people who care about artists’ rights. “Amazon controls too much of the world’s book distribution,” says Padavona. “Nobody wants to see this much power in one entity’s hands. Patreon freely connects authors and readers. Artists receive a fair payment for their efforts, while readers get a steady stream of new horror without having to deal with a middleman like Amazon. Supporting Padavona at the $2 level gains you a minimum of 3000 gloriously gory words each and every month. This includes exclusive short stories, serialized novels unavailable for sale anywhere else, and new novel chapters as they are written (long before anyone else reads them). 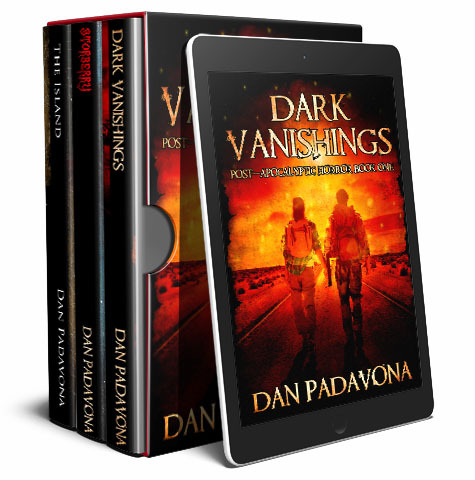 As a bonus, you will have access to future podcasts and blog posts where Padavona discusses horror movies and novels, interviews other authors, answers reader questions, and reads excerpts from his novels. Higher levels of support gain readers free e-books of Padavona’s new releases, weeks before they are available on Amazon. Ready to read Dan Padavona’s newest horror story? Become a patron now.